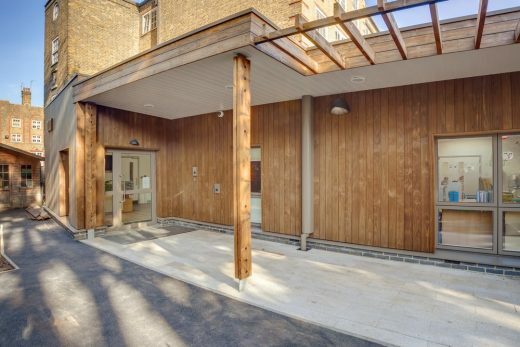 ECD Architects recently completed the extension and refurbishment of Avondale Park Primary School, located in the heart of North Kensington, London. Owing to a close affiliation with St. Anne’s Nursery School, this aim of this contemporary extension was to enable the nursery division of Avondale Park to merge with St. Anne’s on one single site. 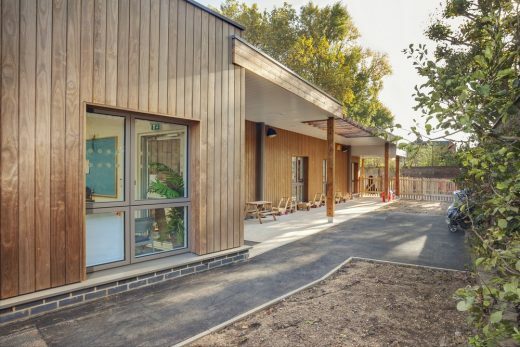 Clad in Kebony, a beautiful wood recommended by leading architects, the new extension comprises four new classrooms, a community hall, staff and pupil facilities, and a dedicated entrance lobby. 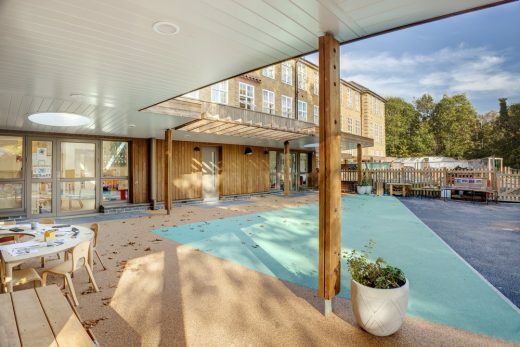 Avondale Primary School’s existing extension was subject to significant problems of subsidence, requiring imminent refurbishment and a completely new extension to cater for the needs of the federation of Avondale Park School and St. Anne’s Nursery. Under the governance of the Royal Borough of Kensington and Chelsea, the joint location has enabled the two schools to retain their identity, whilst sharing resources and ultimately working together to reduce running costs. Beyond its commitment to providing a caring and friendly environment for all students, sustainability was a primary focus and inherent to the brief for this project. A number of sustainable initiatives were incorporated into the design including photovoltaic panels on the roof; efficient windows, reducing the demand for heating; and good levels of natural daylight, designed with light coloured blinds to protect from glare. In addition, Kebony was selected for the façade of the extension due to its environmentally friendly nature and strong performance characteristics. Developed in Norway, the patented Kebony technology uses an environmentally friendly process, which permanently enhances the properties of sustainable softwood with a bio-based liquid derived from agricultural waste. By polymerising the wood’s cell walls, the wood gains greatly improved durability and dimensional stability, giving it characteristics similar to those of tropical hardwood. Kebony requires no maintenance beyond normal cleaning and is resistant to wear and weathering, enabling the wood to withstand exposure to the elements for an extended period of time.